It’s a jungle out there, and we’ve got a subequatorial spin on those freshly showered type of scents we know you love for the office and anywhere else you need to lead the pack. 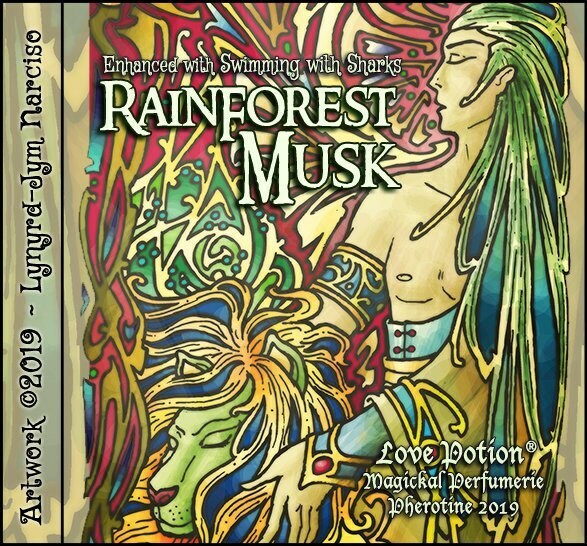 Explore your primal side with our blend of bamboo and Indonesian teak, white musk and the airy shimmer of Hedione, a jasmine derivative purported to produce a pheromone-like response in others when added to scent. And to give you the advantage when the situation gets ferocious we’ve also included a dose of our exclusive SWIMMING WITH SHARKS pheromone formula, which lends an air of respect, appeases and calms people who may bristle against those in authority, and helps people to really listen to what you have to say. Scent: Wet woods and airy, watery musk. BAMBOO ~ Protection, hex breaking, luck and wishes, fertility, wisdom. HEDIONE (JASMINE) ~ Self confidence, anxiety reduction, prosperity; powerful love attractant, spiritual love. DECAYED WOODS ~ Commanding strength and resolve. WATER ACCORD ~ Cleansing, purifying, renewal.